If you follow me on social media you most likely already know that I am about to embark on a 15 day food tour of Italy's Umbria & Tuscany regions. This is not my first visit to the area but I am super excited because it will be my first time enjoying the area as a local....shopping, cooking and eating. Since I will have limited WiFi I will only sporadically be sharing on facebook, twitter and instagram and will have more details of my adventures when I return. 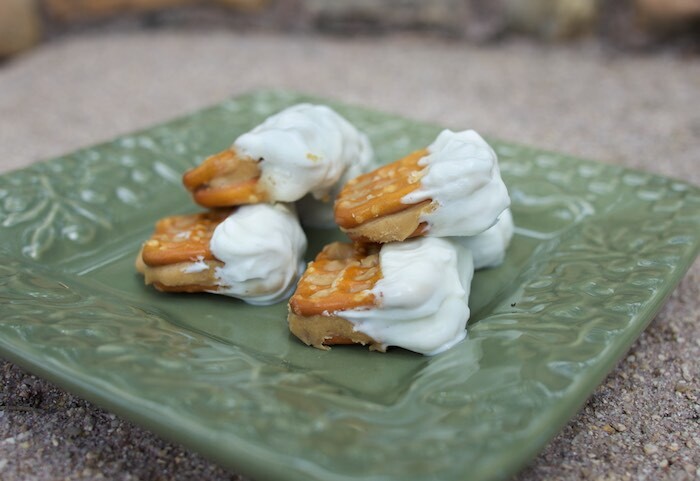 Before I go I wanted to leave you with a healthy snack recipe featuring Stonyfield Yogurt & Justin's Nut Butters. (Justin's offer's naturally delicious almond butter, hazelnut butter, and peanut butter) Both are brands that I enjoy on a regular basis to keep me full and fueled specially when traveling. Airport nibbles are often not the healthiest so I always make certain I have something nutritious stowed in my carry-on when I travel. Yogurt Dipped Nut Butter Pretzel Sandwiches are just that. These salty-sweet goodies are a great way to combat hunger mid-flight or anytime a craving sets in. Preheat oven to 250 degrees. Prepare a metal rack on top of a baking sheet. Mix yogurt with confectioners sugar a little at a time until you reach desired sweetness. (I used about 1 tablespoon per 1 cup of yogurt). Dollop a small sized spoon of nut butter onto one pretzel and top with another to make sandwiches. Dip the sandwiches into the yogurt mixture and place on your rack, allowing the yogurt to drip into the baking sheet. Once all the pretzels are ready place the baking sheet in the oven and turn it off, leaving the door slightly ajar. It will take about 2 hours for the yogurt to harden. Pretzels can be eaten immediately or stored in the refrigerator for about a week. What a good idea for airport snacks! Great snack, my kids would love these! LOVE Justin's Nut Butters! What a great snack! These look like the perfect after school snack for the kids and me! These look perfect for snacking! Hope you enjoy your fabulous trip - can't wait to see the pics! I'm a big fan of sweet and salt pairings so I know I'd love these. Have an amazing time on your trip and I can't wait to hear about it!